The safest play is to the layup patch out to the right. It’s usually a 4-5-wood to get there, almost always high-teed for extra elevation and distance. There’s some snow short, so you absolutely must carry it there — bank off the ice on the back if you need to. That should leave you with another 5-wood approach shot — here’s a hole-out from there. Sometimes that shot is frustrating and you come up short in the snow, costing a stroke. 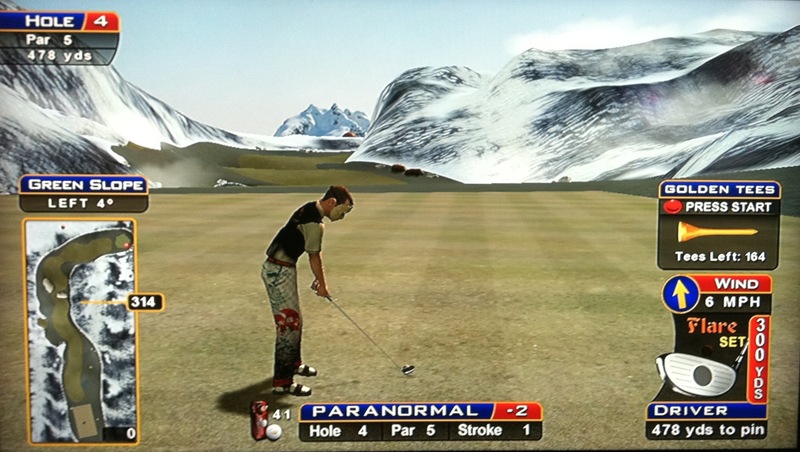 Another option, if you figure out the shot, is to play out to the snow/ice towards the green. From where this shot is lined up in the picture, hit an A1 driver (high-teed in this case) — watch it rattle around in the ice. This one left 112 yards in for an easy eagle! 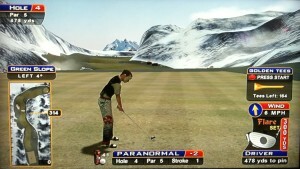 And here’s a high-teed straight driver that bounced over the mountain to the same spot. Or, there’s another spot out here between the mountains where you can plop a 9-wood onto the green — check out this example hole-out! Also look for the Yeti walking around in this area! Here’s another failed shot that ended up plunking the Yeti — he doesn’t sound too happy! Another more difficult grassy patch to hit is to the left of the fairway, but if you’re feeling confident and it gives you a better approach shot with the wind, then it’s an option — here’s a tough hole-out from there. And this 5-wood actually got up over the mountain on the approach! Finally, you can lay up in the fairway short of the sand. You’ll still be able to curve an approach shot into the green from here with a 7-wood. This one found the cup with a 5-wood.